Students who were on a school trip with a pair of teens who caused controversy by wearing Make America Great Again hats to Washington, DC's Howard University said they advised the Trump supporters against wearing the paraphernalia to the historically black college. Allie Vandee and Sarah Applequist sparked anger when they walked onto the campus Saturday wearing MAGA hats and other Trump gear, inflaming tensions that had already been stoked by President Trump's response to the neo-Nazi and white supremacist rally in Charlottesville. In interviews with BuzzFeed News, the Trump-supporting students from Union City High School in Pennsylvania said they were unaware Howard is a historically black college (or HBCU). “No one asked us to take the hats off, no one told us the history of the college other than what year it was established in and who it was established by,” Vandee said Tuesday. But Eunissa Pullium, a 16-year-old student at Pennsylvania's Erie High — the other school on the trip — told BuzzFeed News the group's tour guide had informed the students Howard was an HBCU. Quityn Rogers, another Erie student, said he didn't hear the tour guide through his headphones, but told BuzzFeed News that he, too, warned the girls that their clothing might upset some Howard students. Vandee then posted about the incident on Twitter, where she was re-tweeted thousands of times. Applequist had told BuzzFeed News the Howard visit was a last-minute event, not a planned part of the trip. Vandee, however, had said in a Saturday interview she did believe the HBCU trip was planned. “I think they did plan ahead, because on Thursday when we arrived [in DC] I knew about it,” Vandee said. Tour organizers did not respond to multiple requests for comment. Vandee also objected to wording in the original BuzzFeed News story that implied she had said the HBCU trip was on listed on the physical itinerary. 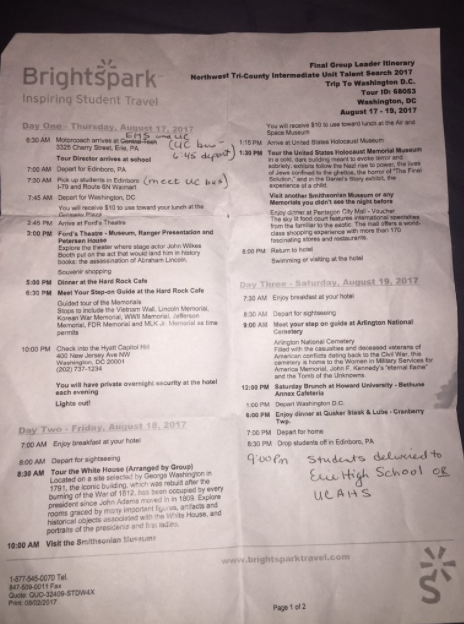 (The line has since been updated to reflect her original quote that she believed the trip was “[planned] ahead” but not on the physical itinerary). All the teens were in DC on a Talent Search trip, a program funded by the Department of Education to give students from disadvantaged backgrounds “academic, career, and financial counseling”, aimed at encouraging them to continue with their studies. Pullium and Rogers say they were embarrassed and disappointed that they had to leave Howard because Vandee and Applequist had not removed their Trump gear. “We weren't kicked out but we were at a point where we had to leave because they were uncomfortable,” Pullium said. Rogers says he doesn't have a problem with other students wearing political gear but that they should consider the impact they could be having in some situations. “You can wear political gear on a field trip. There's nothing wrong with it. But when you’re going to particular places, don't do that. You have to be nice. To me, I felt like that was wrong,” Rogers said. Union City High School, Eerie High School, the Talent Search program, and BrightSpark Travel did not responds to requests for comment.